Click the 3 lines in the upper right hand corner, next to your name. Here you will be able to check on your available storage. Deleting emails will free up your mailbox storage. Caution: If your mailbox storage reaches maximum storage capacity messages will not deliver and will be rejected. Email that was rejected will not deliver after more mailbox space is created. Only new messages will be received after space is created. Move an unwanted message to Trash. Delete the message from the Trash folder. 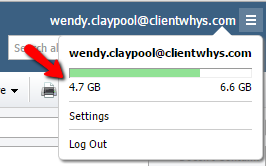 If you need to recover a message that you deleted from trash, see Recover Deleted Email in Webmail. Caution: Messages purged from the Trash folder can be recovered for up to 14 days after deletion. After 14 days, the message cannot be recovered.